In this ever-changing world of online PR strategies and social media campaigns, the humble national newspaper is still of great importance to PROs. Particularly as so many clients still put positive national print coverage above all other campaign objectives. This is why it’s vital for every PR professional to know what makes news in the nationals. But how is the digital age affecting the nationals’ news agenda? And how has it changed over recent years? 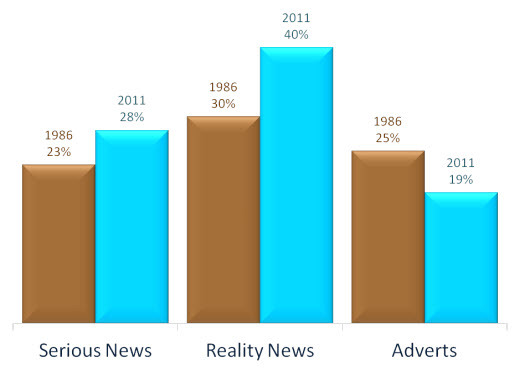 Clarion Communications compared national newspapers from 2011 with their 1986 equivalents. A clear finding is that newspapers are impinging on each other’s traditional territories – with all papers across the spectrum now broadly reporting identical content. 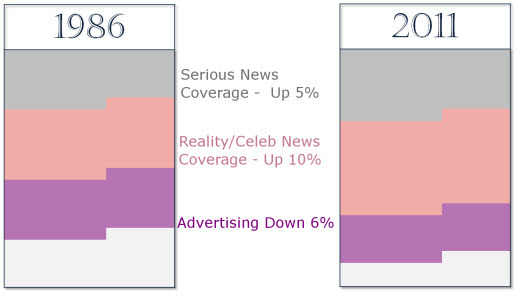 Tabloids are now more likely to give space to “hard” news, including politics and business, and broadsheets are increasingly covering celebrity and other populist news. And while newspapers attempt to keep up with digital rivals, their news coverage has become homogenised – as tabloids and broadsheets move closer than ever before in terms of style, content and subject matter. But while newspapers have changed in many ways since 1986, they are exactly the same in others – with the nationals’ news agenda for Summer 1986 and Summer 2011 full of almost identical subjects, including Royal Wedding Mania (Andy and Fergie versus William and Kate), Troubled Pop Stars (Boy George versus Amy Winehouse) and Soccer Bad Boys (Maradonna’s controversial Hand of God World Cup goal versus Ryan Giggs personal revelations). Howard adds: “Clearly by looking at a single month, our findings are coloured by specific stories of the moment, but it’s clear that distinctions across the newspaper landscape are being eroded. “People are increasingly used to consuming news from websites and social media, where information is much more standardised in terms of format and style – and papers are having to ditch traditional styles, resulting in a merging of papers into a single, homogenised style of news reportage. 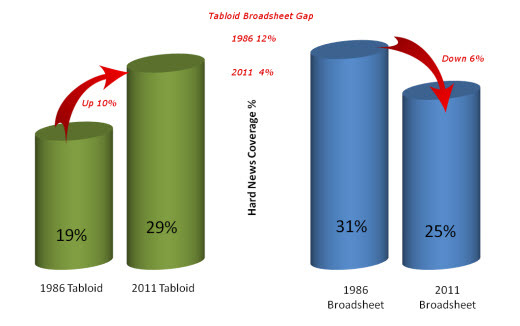 Clarion Communications compared national newspapers from 2011 with their 1986 equivalents. Working alongside Redshift Research, Clarion took issues of tabloids, midmarkets and broadsheets – dailies and Sundays – from the same days 25 years apart, and analysed what made up news in the first six pages. The research involved comparing editions of The Sun, Daily Mail, Daily Telegraph, News of the World, Sunday Express and Sunday Times on identical days in July 1986 and July 2011, specifically in terms of column inches over the first six pages, based on news story categories. As the News of the World ceased publication in mid-July 2011, the Sunday Mirror and People were substituted in its place.